Of this species discovered by Mr. TOWNSEND and Mr. NUTTALL, in the forests of the Columbia river, all that I know is contained in the following notes from these enterprising naturalists:--"The Hermit Warbler," says Mr. NUTTALL, "I have little doubt, breeds in the dark forests of the Columbia, where we saw and heard it singing in the month of June. It is a remarkably shy and solitary bird, retiring into the darkest and most silent recesses of the evergreens, where, gaining a glimpse of light by ascending the loftiest branches of the gigantic firs, it occupies in solitude a world of its own, but seldom invaded even by the prying Jay, who also retreats, as a last resort, to the same sad gloom. In consequence of this eremitic predilection, it was with extreme difficulty that we ever got sight of our wily and retiring subject, who, no doubt, breeds and feeds in the tops of these pines. Its song, frequently heard from the same place, at very regular intervals, for an hour or two at a time, is a soft, moody, faint, and monotonous note, apparently delivered chiefly when the bird is at rest on some lofty twig, and within convenient hearing of its mate and only companion of the wilderness." Mr. TOWNSEND's note is as follows:--I shot this pair of birds near Fort Vancouver, on the 28th of May, 1835. I found them flitting among the pine trees in the depth of a forest. They were actively engaged in searching for insects, and were frequently seen hanging from the twigs like Titmice. Their note was uttered at distant intervals, and resembled very much that of the Black-throated Blue Warbler, Sylvia canadensis. SYLVICOLA OCCIDENTALIS, Hermit Wood-Warbler, Towns., Journ. Acad. Nat. Sc. Philadelphia, vol. vii. p. 190. HERMIT WARBLER, Sylvia occidentalis, Aud. Orn. Biog., vol. v. p. 55. Wings of moderate length, the outer three quills almost equal, the third longest; tail slightly emarginate. Male with the upper parts bluish-grey, spotted with black; the upper part of the head, which is similarly spotted, the cheeks, and sides of the neck, bright yellow; throat black; breast and abdomen white; ground and tail-feathers greyish-dusky; two white bands on the wing formed by the tips of the secondary coverts and first row of small coverts; two outer tail-feathers on each side almost entirely white. Female with the upper parts of a duller grey, the yellow of the head less extended and not so bright; throat whitish, spotted with dusky. Male, 3 5/12, wing 2 8/12. 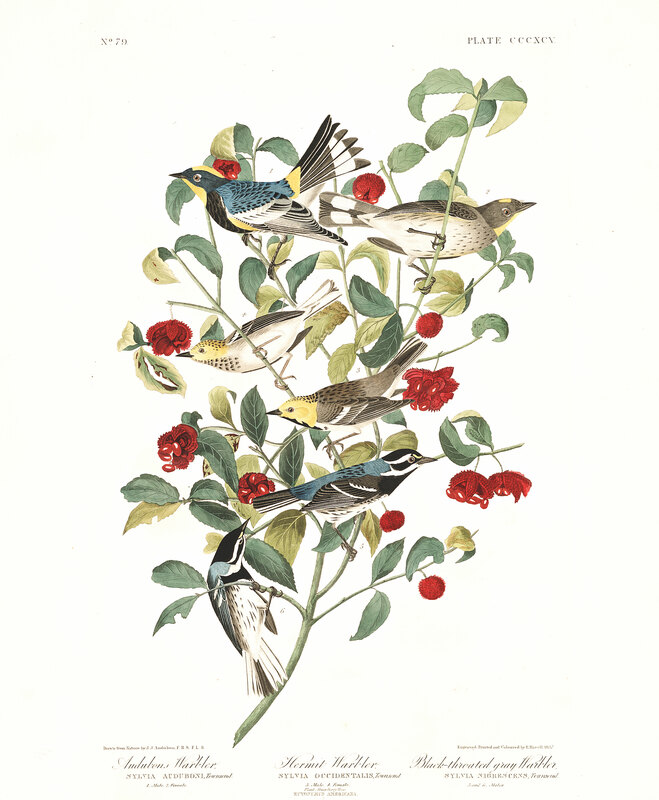 For a description of the plant see "Audubon's Wood Warbler."